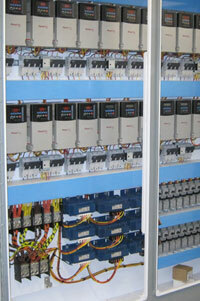 Custom Electric, Inc. is an industrial electrical contractor that has been in business since 1984. We have vast experience in all industrial applications including the following: water and waste water, wood products, mines, natural gas pumping, petroleum product pumping stations, petroleum product additive and loading systems, food processing, car wash, and conveyor systems. Custom Electric has the ability to manage projects from the design phase to start-up and commissioning. All Content Copyright 2019, © Custom Electric, Inc.